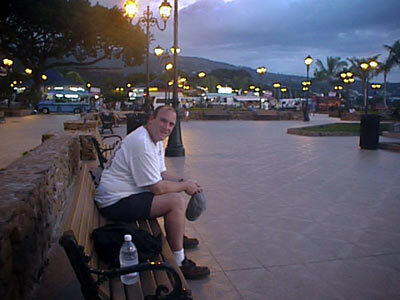 Papeete is a dirty and crowded port town with very little charm. We enjoyed only a few aspects of the town. Its main saving grace is a small waterfront area where restaurants trucks park every night. It is enjoyable to watch the sunset from a park bench while listening to live music. Then, after the sunset, as more restaurants pull up and park, more people gather in the park and soon it's time to walk among the trucks and choose where you'll eat dinner. We also enjoyed a lunch we had at the Sheraton "compound" between the airport and town. The Sheraton is surrounded by 10 foot high walls - so it is completely isolated from the real Papeete! Tara commented that they had artificially created a movie version of Polynesia inside those walls. And it was an enjoyable place for lunch. It was especially enjoyable since we were the first to arrive. We got the best over water seat and the waitresses even brought us day old bread so that we could feed the fish. That was fun! Finally, we were pleasantly surprised at the Airport Lodge. The owner really loved plants and animals and it added a special charm to an otherwise dreary place. For example, there were numerous flowering species lining his driveway and patio. 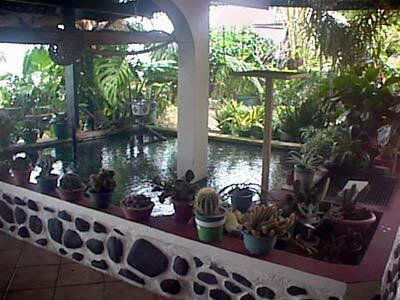 In the center of the patio was a large fish pool and a small turtle enclosure. There were also a large number of cats wandering around. 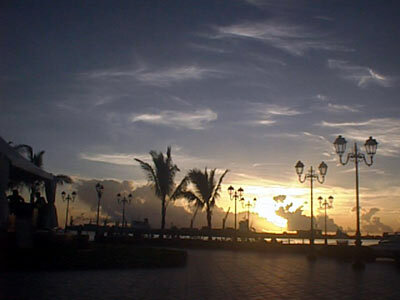 Other than these three aspects, we cannot think of much else enjoyable in Papeete. We mainly have unpleasant memories. For example, during the first 15 minutes after our arrival, we were given bad information from the information counter, found out that 2 of our 3 cirrus ATM cash cards did not work even though the machine clearly said cirrus and confronted a taxi driver who tried to overcharge us. Then, upon arrival at the Royal Papeete hotel, we found out just how much of a dump you get when you pay 9,000 Pacific Franc (50 GBP, 70 USD) for a room. We had to use our own flashlight to climb the stairs since there was no lighting in the stairwell. We again had to use the flashlight to determine if the suspicious looking lump under our bed meant that someone had crapped there. Thankfully, the long sausage shaped lump under our bed was indeed a sausage, not human waste! Tara thought that at some earlier colonial time, the hotel may have been quaint. We definitely think that our phone was a throwback to some colonial era - since we've never seen such a phone with an extra listening earpiece! The main reason we were in Papeete was actually to buy onward tickets to Easter Island. Our Lonely Planet book said that you could find cheap tickets to Easter Island from Papeete. Depending upon your definition of cheap, we agree with the Lonely Planet. Less than an hour after leaving our hotel on the first morning, we'd purchased two tickets for Easter Island. The only problem was that the next flight out left at 1:30am in two nights time. So, we had three full days to spend in Papeete. The rest of our first day was spent wandering around the town doing errands. At least we found the fun, cheap trucks at the waterfront for dinner! It was a pretty sunset and we enjoyed watching barefoot kids running around the central bandstand and playing on razors. We also enjoyed watching small, traditional boats share the harbor with large container ships. Our first dinner experience from a mobile truck was also pleasant. We had yummy crepes. Too bad that Tara then decided to splurge on a waffle covered in that chocolaty-sauce that Americans don't eat but Australians and Europeans do.... The chocolate gave her a headache for the following two days. We had big plans for the next day: go out to an expensive hotel for lunch. Well, we got a late start and by just before 3pm, when we asked downtown tourist information in town about public transport, we were told that the last "Le truck" on the line we wanted had already left for the day. So, we stayed in Papeete. We had had enough of the actual town, so we parked ourselves in the same waterfront area as the day before and endeavored to catch up on our postcard writing. It was again a pretty sunset followed by a restaurant truck meal - Italian this time. Our final day in Papeete was more of the same. We decided to stay until midnight in the crappy Royal Papeete Hotel since we figured that even five hours of sleep would be better than none. At least our room was air-conditioned and the sausage under the bed had been removed. (Tara mimed to the French speaking housekeeper to come look and then shown her flashlight on the sausage. The housekeeper said "sausagi" as if it was the most natural thing to find under a bed and then removed it for us.) We went into town in search of a few T-shirts. 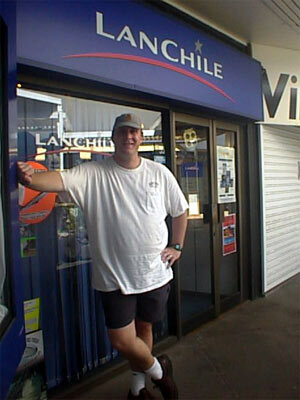 The Lan Chile lady (from Finland actually) told us that they sold "Tara T-shirts" when she was entering our names onto our tickets. Downtown tourist information pointed us in the right direction and Seth easily found the Tara store. Three T-shirts, two sweatshirts and 73 Pounds later, we were done. Now that we had T-shirts and postcards to mail, we headed to the post office. Typically French, the employees were on strike and the post office was closed. We lugged everything with us to Easter Island. The final point of note about our last day was that we had to make a decision about whether or not to pre-book and pay for a flight to Bora Bora. We knew that we'd be coming back to the Papeete Airport at 1am and that there was a 6am flight 5 hours later to Bora Bora. Tara was worried that maybe we wouldn't get to Bora Bora if we didn't secure reservations today. However, Seth talked sense into her. He reminded her that over the past few months, we wished we'd had more flexible airplane tickets instead of non changeable frequent flier free tickets and that by booking today, she'd just be giving us another flight obligation. It made total sense to Tara, so we didn't pre-book. We instead had a quick dinner and returned to our hotel room for at least part of a night's sleep. Our midnight, dredlocked taxi driver was a real character. His well used taxi also left a lot to be desired, as it would have been at home in Tonga (i.e.. the engine only started after numerous attempts and died at least once). He, like all taxi drivers in Papeete, tried to overcharge us for our trip to the airport. After Seth called him on this, he took the lower price we were willing to pay. However, he did provide an entertaining tourist commentary all the way to the airport and even offered us a refilled bottle of water. We took his gift of water, but immediately disposed of it at the airport since we were not drinking the local water. Ahh, the Papeete airport. The second of EIGHT times that we'd be here (mostly in the middle of the night!). We ended up at the Papeete Airport a total of 8 times! How did we end up here 8 times? The airport itself has fine facilities, but the information center is worse than useless, prices are exorbitant, international flight times are in the middle of the night and the majority of shops were always closed. We've also given airport tourist information the "worst tourist information in the world" award for the lack of information provided. Not only were they incapable of answering simple questions such as "what is the cheapest transportation into town? ", but they provided us with wrong information on the opening hours of Air Tahiti. More about airport tourist information later. Between our third and forth times at the airport, we did enjoy a fun afternoon eating lunch while feeding fish at the nearby Sheraton Hotel "compound". Inside the compound, it was a nice recreation of what Polynesia is like in the movies! Also during our third and forth times at the airport, we met two fellow travelers that we ended up spending a lot of time with in Bora Bora. Ben and Mary were hoping to take a ferry to Bora Bora instead of flying. They had similar problems with Tourist Information and approached us to see if we could help. Since Seth gets sea sick on hour-long boat rides, there was no way we'd even considered a 17-hour freighter ride. We couldn't help them with info on the ferry, but it did start us talking and we're glad we did end up seeing them again on our fifth time in the Papeete airport, since we ended up sharing many fun activities with them on Bora Bora. During our last five hours in Papeete (between airport visits number six and seven), we had one important errand - pick up Tara's visa card from the Royal Papeete hotel. One morning in Bora Bora, Tara was frantically looking for her credit card and couldn't find it. She did find a receipt though from the Royal Papeete and figured that maybe she'd used it there last. Sure enough, when she called, they said straight away "oh yes, a red Natwest card". That's hers! She was very relieved. We also did more Tara T-shirt shopping. Both for Tara herself and also Mark's wife Tara. And then, after a quick dinner with Mary and Ben at a Chinese truck, we went back to the airport on Le Truck to await our transfer to the Airport Lodge. Only one last time at the airport. Our 8th and final visit! A one-way trip out of The South Pacific islands to Auckland, New Zealand. Reasons why it is better to not even ask the information center. We do not think there were miscommunication due to the misunderstanding of English. Tara "Hi, what is the cheapest way to get into town?" Info Center Woman "Well, you can take the bus, but you have to wait, so taxi." Tara "How long is the wait for the bus?" Info Center Woman "I don't know. Take a taxi." Tara "Are the taxis metered?" Tara "How much should a ride into town cost then?" Info Center Woman "No more than 30 Dollars." Tara "The taxi drivers accept US Dollars?" Info Center Woman "No. You have to pay in Pacific Francs. Go to the bank." Tara "So, how many Pacific Francs should the taxi ride cost us?" Info Center Woman "30 Dollars." 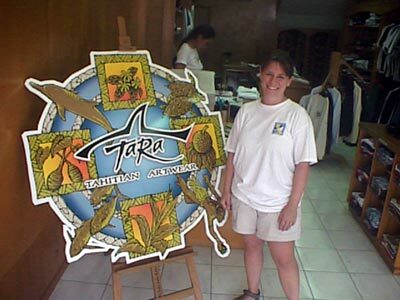 Tara "And how much is that in Pacific Francs?" Info Center Woman "Go to the bank." Tara "Hi. 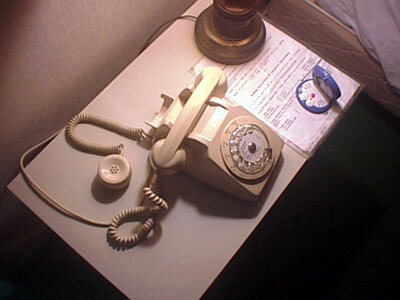 Can I get the phone number for Air Tahiti?" Info Center Woman "Their office is over there, they open at 5:30am"
Tara "But, I want to call them tomorrow." Info Center Woman "You can just wait, they open at 5:30am." Tara "But we wanted to sleep in guesthouse or hotel near the airport." Info Center Woman "They are too expensive." Info Center Woman "Too expensive. Sleep in the airport." (note: there are NO long, connected sets of seats unless you pass through immigration and are departing the country. All seats are fitted to individual people"
Tara gives up, she's been here before! She calls the number of the Airport Lodge, they are picked up 10 minutes later, and pay 6,800 for a room with breakfast and round trip airport transfers. This is about 37 British Pounds or about 50 US Dollars. The airport info center never told Tara HOW MUCH she'd actually have to pay, just that it was "too expensive" and as we were waiting for our Airport Lodge pickup, both of us see an open Air Tahiti counter. 9,000 Pacific Franc a night for a room for the first two nights of your stay. If you agree to stay three nights (we would not recommend this!) the price drops to 8,000 a night.